Even if you are not a Beatles fan, you will probably enjoy this video. Here's a clip you most likely have never seen - the recording of Get Back for the Let It Be album written primarily by Paul McCartney and credited to Lennon/McCartney. In their early days, The Beatles played in clubs for hours most nights, but by 1967, they stopped touring. This single was advertised as "The Beatles as nature intended." McCartney: "We were sitting in the studio and we made it up out of thin air... we started to write words there and then... when we finished it, we recorded it at Apple Studios and made it into a song to roller coast by." The character "JoJo" was based on Joseph Melville See Jr., Linda McCartney's first husband. He was from Tucson, Arizona, and killed himself there in 2000. The missing verse from Get Back: "Meanwhile back at home there's nineteen Pakistanis, Living in a council flat/Candidate for Labour tells them what the plan is/Then he tells them where its at". ("Council flat" is the British equivalent for "housing project"). Early versions include the line "I dig no Pakistanis." The song began as a commentary about immigration, telling people to "Get Back" to their own countries. It was meant to mock Britain‚s anti-immigrant proponents. Paul McCartney thought better of it and made the lyrics more obscure. During the recording, Paul looked at Yoko in the studio when he sang the line "get back to where you once belong." John thought he was disrespecting her.. There was a rare quote by Paul that said "I don't take any notice of her. She's John's wife so I have to respect her for that, but I don't think she's the brightest of buttons. She's said some particularly daft things in her time. Her life is dedicated to putting me down but I attempt very strongly not to put her down." They eventually became friends even if it did have to be after John was murdered. Ringo was the only one who would accept Yoko in the beginning when she first came in picture, during and after The Beatles. 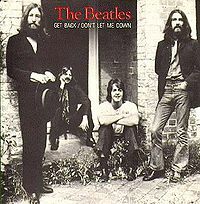 Billy Preston played piano and became the only guest artist to get a credit on a Beatles single - "The Beatles with Billy Preston." George Harrison had left the recording session one day and saw Preston in concert with Ray Charles. The Beatles had met Preston back in 1962 when they were both playing in Germany, but they hadn't seen each other since. Harrison asked Preston to come by the studio the next day. Having him in the studio eased the tension and made it easier for The Beatles to put personal conflicts aside and record the album. On the clip you can briefly see a young Mick Jagger & Charlie Watts from the Rolling Stones in the booth. Phil Spector was the guy with the glasses. An even more complete anthology of the Get Back recording can be found at Wikipedia.